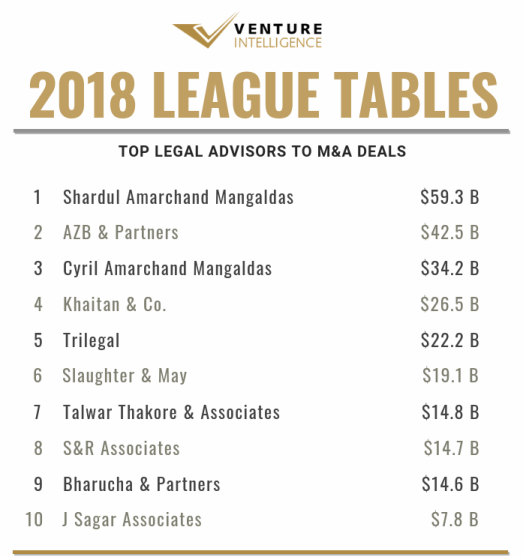 Shardul Amarchand Mangaldas (SAM) topped the Venture Intelligence League Table for Legal Advisor to M&A Transactions in 2018. SAM advised M&A deals worth $59.3 Billion (across 69 qualifying deals) in 2018. 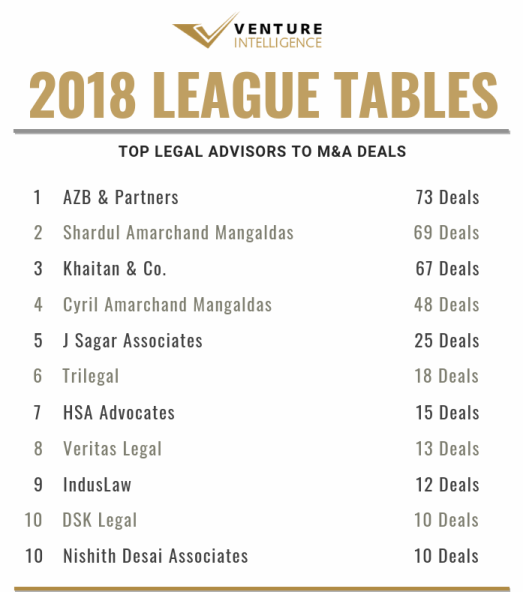 AZB & Partners ($42.6 Billion across 73 deals) and Cyril Amarchand Mangaldas (CAM, $34.2 Billion across 48 deals) took the second and third spot. 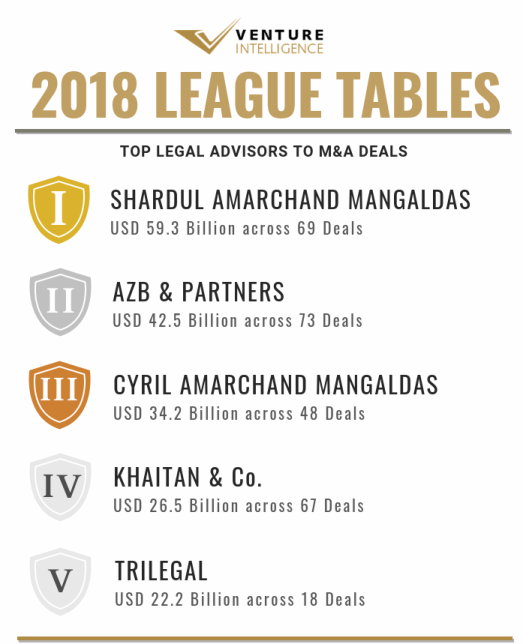 Khaitan & Co. ($26.5 Billion across 67 deals) and Trilegal ($22.2 Billion across 18 deals) completed the top five in 2018. SAM advised deals include Walmart's $16 Billion acquisition of Flipkart and the $14.6 Billion merger between Indus Towers and Bharti Infratel. AZB advised deals include the Indus Tower - Bharti Infratel merger and the $5.7 Billion merger between HPCL and ONGC. CAM advised deals include the Walmart - Flipkart deal and the HPCL - ONGC merger. Among foreign firms, Slaughter & May came in at the top advising 2 deals worth $19.1 Billion. Shearman & Sterling came in second advising deals worth $7.4 Billion. Jones Day came in at third advising 3 deals worth $4.2 Billion. AZB topped the tables in terms of deal volume notching up 73 deals during the year. SAM took the second spot with 69 deals, followed closely by Khaitan with 67 deals. CAM and J. Sagar Associates (JSA, with 25 deals worth $7.8 Billion) occupied the fourth and fifth place respectively. Among M&A transactions in IT & ITeS (by value), Khaitan stood first followed by SAM and Trilegal. CAM and HSA Advocates came in at fourth and fifth. By deal volume, SAM stood at first place with 21 deals followed by Khaitan. AZB stood third with 14 deals followed by CAM. JSA and Legalogic Consulting. AZB topped in Infrastructure deals with $23.4 Billion, followed by SAM. Legal advisors to the Indus Towers - Bharti Airtel merger including S&R Associates, Talwar Thakore & Associates, Bharucha & Partners and Slaughter & May came in at third place. CAM came in fourth, followed by HSA in fifth place. AZB (with 18 deals) also topped by deal volume, followed by SAM, Khaitan, HSA and CAM in second place with 11 deals each. Trilegal and IndusLaw occupied the third spot with 4 deals each. In Financial Services, AZB topped the table with $2.2 Billion, followed by SAM (with $1.7 Billion). Trilegal came in at third place. Luthra & Luthra topped in Healthcare & Lifesciences advising deals worth $1.4 Billion, followed by Khaitan ($1.3 Billion) in second place and CAM in third place. AZB and Nishith Desai Associates (NDA) occupied the fourth and fifth place respectively. In Real Estate, JSA topped with $789 million, followed by SAM with $730 million. CAM occupied the third place followed by AZB and HSA. Click here to view the ranking by deal value. Click here to view ranking by deal volume.